Cesar Sayoc, 56, has been arrested after a number of suspected mail bombs were sent to critics of US President Donald Trump, authorities say. The suspected bombs were found across the country, from New York to Los Angeles, and were reportedly crudely made and sent in similar envelopes. None of the packages exploded, and the suspect has been taken into custody. He faces five federal crime charges: interstate transportation of an explosive, illegal mailing of an explosive, threats against former presidents and other persons, threatening interstate communications and assaulting current and former federal officers. Law enforcement officials say Cesar Sayoc is the principal suspect, and that fingerprint samples, DNA and mobile phone data were used to track him down. He is a resident of south Florida and has a criminal record. Mr Sayoc also reportedly has ties to New York. At a news conference on Friday, Justice Department officials announced Mr Sayoc was in the custody of the FBI. FBI Director Chris Wray said the nationwide investigation spanned "from New York to Delaware to Maryland to the District of Columbia to Florida to California". Mr Sayoc was identified in the last 36 hours, the director said, after his fingerprint was discovered on a package sent to Congresswoman Maxine Waters. Mr Wray also said they confirmed Mr Sayoc's DNA from two different devices mailed in different envelopes with a DNA sample from Mr Sayoc, collected from a previous arrest. Late on Thursday night, the FBI confirmed this information with Florida law enforcement. Electronic devices were used to ping and track his mobile phone, leading to his arrest in a car park in Plantation, Florida. Mr Sayoc's Twitter account was also used by investigators to confirm his identity. Several posts misspelled "Hillary" as "Hilary" and "Schultz" as "Shultz", which is the same spelling mistake that appeared on the envelopes that contained the explosives, officials say. "We do believe we've caught the right guy," Mr Wray said. "But we also know that this is an ongoing investigation and there's a lot of work to be done - there are still plenty of unanswered questions." The first device was found in a postbox near the New York home of billionaire businessman George Soros on 22 October. Mr Soros, a major donor to the Democratic Party, has become a frequent target for criticism by right-wing groups because of his support for liberal causes. The item was discovered by one of his employees and it was later destroyed by bomb squad officers. Police said the package contained explosive powder and "had the components" of a bomb. The following day, the Secret Service discovered a package addressed to former Secretary of State and Democratic presidential candidate Hillary Clinton. It was reportedly found during a routine screening of mail sent to the home she shares with her husband - former President Bill Clinton - in Chappaqua, New York. A US official told the Associated Press that it was a "functional explosive device". 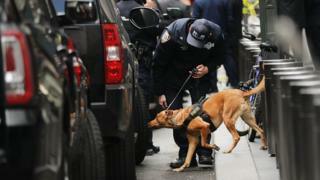 A third package, addressed to former President Barack Obama, was intercepted early on 24 October in Washington DC. "[The] packages were intercepted prior to being delivered to their intended location," a statement from the Secret Service said of both incidents. The next development occurred when CNN's New York office was evacuated on Wednesday morning after a suspected bomb was sent to their mailroom. It was addressed to former CIA Director John Brennan, a vocal critic of Mr Trump, who was scheduled to appear on the network that day. Police say they found an "envelope containing white powder" in the packaging of the device. The network was on air when the package was discovered, and an alarm could be heard in the background as the presenters discussed the story. Later that day, reports emerged that former Attorney General Eric Holder had been sent a suspected explosive device. This was followed by news that another device, addressed to Democratic Congresswoman Maxine Waters, had been found at a mail sorting facility near Washington, DC. A second suspicious package addressed to her was later discovered in Los Angeles. 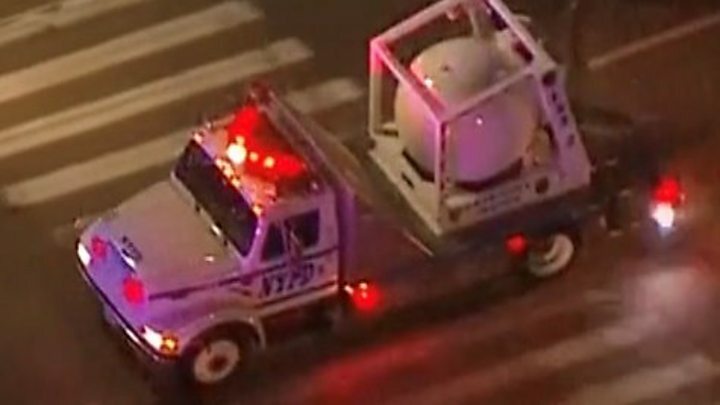 On Thursday, shortly after 05:00 local time, another suspected explosive device was found in New York City. It had been sent to the Tribeca Grill in Manhattan, a restaurant owned by the actor Robert De Niro. De Niro - the star of films Raging Bull and Meet the Parents - is a vocal Trump opponent and once called him "a national disaster". The package was similar to the previous examples, officials said. The FBI later confirmed that two further suspicious devices had been sent to former Vice-President Joe Biden in Delaware. On Friday, more packages were found. One was located during a search of a Florida mail facility and was addressed to the Democratic Senator Cory Booker. The other package was discovered at a post office in New York and the target was ex-national intelligence chief James Clapper. Later, two more were discovered in California. Billionaire and Democrat donor Tom Steyer said that a package sent to him had been intercepted at a mail facility in Burlingame, and another addressed to Democrat Senator Kamala Harris was reported in Sacramento. What do we know about the packages? None of the suspicious packages exploded and there have been no reports of injuries. FBI Director Mr Wray described the devices as "roughly six inches of PVC pipe, a small clock, a battery, some wiring, and what is known as energetic material", which is material that can give off heat and energy as a reaction to heat, shock or friction. "Though we're still analysing the devices in our lab, these are not hoax devices," Mr Wray said at a news conference on Friday. The Florida congresswoman said she was "deeply disturbed" by the way her name was used. The devices are suspected to be pipe bombs. The one sent to CNN - of which there are pictures - is wrapped in black tape and was about 6in (15 cm) long. FBI Assistant Director William Sweeney has confirmed that the white powder found in this package "did not present a biological threat". Investigators are working to establish whether they were capable of detonating. An X-Ray of the package sent to De Niro reportedly showed it contained a device matching the others which resembled a pipe bomb. All of the packages are now being examined at the FBI laboratory in Quantico, Virginia, outside Washington DC. Unnamed officials told US media that investigators believe at least one was sent from Florida, and the FBI searched a mail facility near Miami late on Thursday. The political fallout has been swift. Conservatives claim Democrats, including those who were targeted in the bomb scare, have encouraged "angry mob" behaviour. Mr Trump has called on the media "to stop the endless hostility" following the incidents. But his critics say his comments are hypocritical, as he often uses vicious language against his opponents and the press. Media captionDonald Trump: "Stop endless hostility"
CNN Worldwide President Jeff Zucker was one such voice. 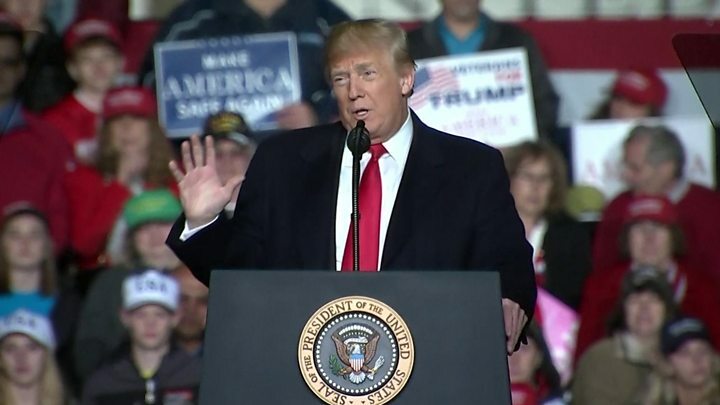 "There is a total and complete lack of understanding at the White House about the seriousness of their continued attacks on the media," he said on Wednesday. White House spokeswoman Sarah Sanders praised Mr Trump's reaction to the bomb scares on Fox News, saying: "The president, I think could not have been more presidential." She added that "certainly the media has a role to play in this process" adding that "90% of the coverage of this president is negative despite the historic successes". Some of Mr Trump's supporters have also said they believe the packages are part of a Democratic plot to win votes in the mid-terms, but there is no evidence for this. What have the targets said about Trump? Every person who has been sent a package is known to be a critic of the president. Mr Soros, the target of the first package, branded Mr Trump "an imposter, a [political] conman and a would-be dictator" during a speech at the World Economic Forum in Davos last year. In return, Mr Trump has pinned a number of unsubstantiated accusations on the businessman. Most recently, he accused him of paying women to protest against Brett Kavanaugh's nomination to the Supreme Court. Senator Booker - a possible 2020 presidential hopeful - was a vocal opponent of Mr Kavanaugh's nomination and is a frequent critic of Mr Trump. "We cannot surrender America to Trump," he tweeted last year. "We must fight." In a similar vein, Mr Brennan and Mr Clapper have both made regular TV appearances in which they have criticised the president. Mr Brennan's security clearance was revoked last year by Mr Trump, who described the ex-CIA director as a "political hack" and a "loudmouth". De Niro, who has previously said he would like to punch Mr Trump, received a standing ovation for his verbal attack on him at this year's Tony Awards. Mr Trump hit back on Twitter, describing De Niro as a "very Low IQ individual" who "has received to [sic] many shots to the head". Video ‘Treasonous traitor’ Who’s talking about who?